The Saratoga Race Course is located in Saratoga Springs, NY. To get to the history of the race course, we must first take a look at the history of Saratoga, which can be traced back to as early as the 14th century. Around this time, indigenous Native Americans lived and visited the Saratoga region. Much of the appeal of this special place had to do with the healing waters (mineral springs), some effervescent, which were credited with curing myriad ailments. The village - then town - grew and evolved into the city of Saratoga Springs - and the waters were always the main attraction. By the mid-1800s, the city was the summer home of many wealthy Americans and internationals, and a hotbed of both tourism and gambling. The American Civil War (1861-1865) was little distraction to those who sought refuge from the heat of cities like New York and Boston, and so, Saratoga Springs grew. On August 3, 1863, gambler, casino owner, ex-boxing champion, and future congressman John Morrissey organized Saratoga's first thoroughbred meet a month after the Battle of Gettysburg. At the old dirt track on Union Ave., later known as Horse Haven, Morrissey staged a four day meet. Over 5,000 people came to watch and wager on the eight races. After the successful meet ended, Morrissey was prepared to expand further into this new venture. He enlisted his friends, the wealthy John Hunter, Leonard Jerome, and William Travers, to form the Saratoga Racing Association. The next step for Morrissey was to purchase 125 acres of land on the other side of Union Ave. and build an all new grandstand. 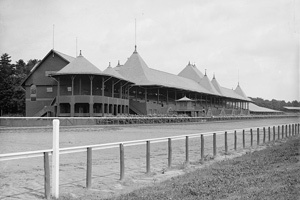 As a result, Saratoga Race Course was born. Although Saratoga Race Course is considered the third oldest race track/course in the U.S., by many accounts, it is the oldest organized sporting venue of any kind in the country. The length of the meet has grown with time, to the current 40 days/six-week season. In 1864, the Saratoga Racing Association named a stakes race for William Travers, and that race became the oldest major thoroughbred horse race in America. The Travers, nicknamed the Midsummer Derby, brings together the greatest three-year-old horses to the race course to compete for the $1.25 million purse. The world's most accomplished thoroughbreds have raced on the hallowed ground of Saratoga Race Course, for indeed, Saratoga is the gold standard. Names such as Secretariat, Seattle Slew, Affirmed, Rachel Alexandra, Curlin, Gallant Fox, the mighty Man o' War, and American Pharoah all spent time in residence in the primeval backstretch, and racing on the track. It's impossible to measure the contributions that Saratoga Race Course-and the annual event that attracts thousands of race fans to the city-have made to American and world culture. The name "Saratoga" is known around the planet, for the name evokes so many images: the elegance, majesty and traditions of the world's oldest sport, regally-bred horses (and owners)-the unspeakable wealth of royals, captains of industry and rock stars who participate as owners, breeders, and fans. Filmmakers and other media have sought out Saratoga and the race course as both the main focus or as a set. Filming in Saratoga, and at Saratoga Race Course, assures original beauty that no set designer could reproduce, i.e. films such as "Seabiscuit," "Saratoga," "The Horse Whisperer," "Billy Bathgate," "Ghost Story," and "My Old Man." A scene in Ian Fleming's James Bond novel, "Diamonds are Forever," features a scene at the Saratoga Race Course. Other authors, as well, have long been enamored with the haunting, untouchable beauty of the place: Edna Ferber and Stephen Dobyns to name a few. Over the years, while Saratoga Race Course has morphed, it has never compromised its sense of history and original purpose. One of the most unique aspects of the race course is that horses walk right through the crowd, on a white-fenced path, to get to the paddock for their races. Such a thrill, to get to stand so close to actual greatness-to see the sun glimmering off the horses' beautifully-maintained coats. To experience their eyes, their musculature-that close, and personal. 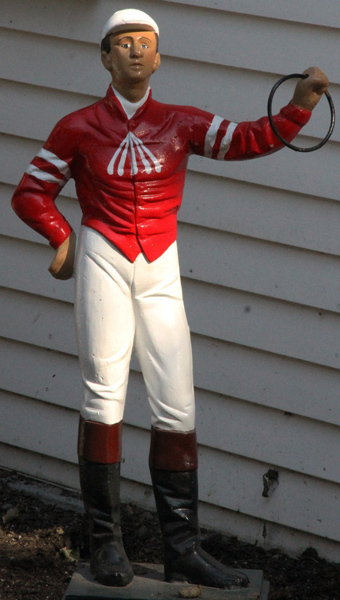 The Big Red Spring in the backyard (picnic area) has delighted patrons of the race course since the 1800s. The Travers Canoe, floating serenely on the infield pond, reminds fans of the previous year's winner. The hand-rung bell, which sounds exactly 17 minutes before each post, reminds the horses and riders that it's time to go. Another gentle reminder of the days before jumbotrons and audio systems, when the metal note of a bell rang out through the pristine, wooded race course. In 2013, the Saratoga150 Committee planned several months of events to delight virtually every heart. The celebration was for Saratoga Race Course's 150th anniversary, and those involved in making it a permanent, significant race course in America. The Saratoga Race Course has a storied history, and it continues to grow every year. The buzz around American Pharoah's (2015's Triple Crown winner) loss at the 2015 Travers Stakes reminded everyone about Saratoga's history as "The Graveyard of Champions." Only the best in their respective divisions dare to come and test their talent at the Spa, to compete at the historic race course.